Thats right! Payment pages are now fully responsive and will look great on phone, tablet or desktop devices. WPS allows your business to create beautiful branded payment pages to collect payments for a wide range of needs. Now your customers can easily make a payment from their mobile phone. 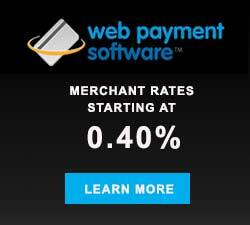 Web Payment Software provides businesses cost effective merchant rates and online payment solutions. If your organizations wants to collect payments online for events, annual meetings or membership dues you owe it to yourself to compare our pricing with the other mainstream players. For events with hundreds of attendees that take in $50k plus, WPS can save you thousands of dollars. Find out why customer have relied on WPS since 2004. Why is cost plus pricing the best choice for a merchant account? Web Payment Software is a simple and affordable e-commerce solution for any business. But if you’re brand new to e-commerce, you might be a little overwhelmed with the whole process. There are so many different options — where do you begin? Lets take a couple minutes to break it down. You’ve probably seen the term “merchant account” everywhere. But what is it? It’s just a bank account that will allow your business to accept credit cards. Choosing a merchant account can get really, really confusing. At Web Payment Software, you do need a merchant account, but we take the pain out of getting one. We team up with the nation’s top payment processors to get you the best rates, quick turn around times, and great customer service. Assuming proper documentation is provided, you’ll have your merchant account in as soon 48 hours. Once you have your merchant account, you’ll be able to use all of Web Payment Software’s features. Our software adheres to Payment Card Industry-Data Security Standards, otherwise known as PCI-DSS. So rest assured, your credit card data is protected under the toughest security standards in existence. We offer a comprehensive suite of payment tools on one platform, for one merchant account, for one very low price. When you use Web Payment Software, these are the ways you can accept money. 1. Payment Pages: Ever need an online payment website template for an event, donation, products, invoice, etc.? That’s where payment pages come in handy. Payment pages are hosted on Web Payment Software’s secure serves, which takes the hassle out of being PCI complaint. 2. Payment Gateway: The online payment gateway is like the point of sale terminal is in a physical location. It will process cards, verify them, then accept or decline them. Our gateway fee is half of what Authorize.net charges. 3. Virtual Terminal: If you ever need to accept a payment from the phone, the virtual terminal has you covered. It will turn any computer with an internet connection into a virtual terminal. You can even use it on a mobile device. 4. Mobile Payments: Accept credit card payments on the go! This card reader plugs into the bottom of your iOS device. You can call us for more info regarding prices. 5. Recurring Payments: Tired of sending invoices? Well, Web Payment Software will let you send recurring payments! Your buyer will get billed on a fixed schedule. We offer a lot of bang for the buck, and our rates are much lower than the competition. If you check out our pricing sheet, one thing you’ll notice is a 2.25% – 2.7% + $.25 each transaction fee. Since that price ranges a little, how do you know what yours will be? Some credit card transactions are riskier than others (AKA “non-qualified transactions), so the bank assesses a higher processing fee. Non-qualified transactions are usually because of failing address verification, no CVV verification, the nature of the products sold, etc. So there you have it – a little breakdown on getting started with Web Payment Software. Any questions? Feel free to contact us. The event marketing industry is witnessing tremendous growth even against the backdrop of digital marketing techniques. According to Market Charts, 83% of B2B marketers today leverage event marketing to boost growth and their budgets in events are increasing gradually. 56% of marketers increased their event budgets in 2016 according to a Selligent 2016 Marketing Survey. According to a similar study by Marketing Profs & Content Marketing Institute, 77% of use in-person events for their content marketing strategy. 67% of B2B marketers believe events are a more effective marketing strategy today again highlighting the potential for event marketers. Measuring of ROI for ongoing marketing efforts for the business. Securing a sufficient marketing budgets in the backdrop of increasing costs of operation. Finding the right people for your marketing team. There are many other challenges, many of which keep changing. Two decades back, no one would have thought social media would become a major game changer in business, but today any firm that is not leveraging social media networks is on its way down. As such, it is important for an event organizer to keep refreshing their marketing strategy in order to stay ahead of the competition. While these challenges might seem insurmountable, you can leverage emerging technologies to stay ahead. Social media, video marketing and other new technologies might be labelled disruptive, but a suave marketer will turn them into an opportunity. Influencer marketing is now real and while this idea has always existed in business, it is now even more crucial with the rise of internet technology. Influencers are a great way to help make your events conspicuous. If an influencer mentions your forthcoming event in a blog post, you can bet many people will flock to see what you are doing. However, you have to appreciate that influencers have multiple requests from other businesses and you have to stand out in the terms of the content you are sharing before asking for a recommendation. Take time to research the best influencers and follow them on social media to make yourself noticed. When the time is ripe, send your request. The first thing people look at when they are looking for an event management company is your reputation. Who are you and what makes you the best option? If you don’t stand out in your city then don’t expect orders from clients. You have to leverage social media and remember it is not a one-off project, but a long term strategy that involves a lot of hard work. Create your profile and nurture your social media accounts gradually as you angle yourself as an authority. Make sure your events are creating a buzz on social media by getting people to share them on Instagram and other networks. The more people get to know you, the easier it becomes for them to engage with your brand. Truth be told, event marketing is not for the fainthearted. It is a multi-billion dollar industry where you will be competing with renowned entities. As such, you have to use the most creative avenues to market your events in order to get noticed. Start small with an affiliate program through local bloggers and businesses. Offer complimentary tickets to events and other goodies to make your offers irresistible and share your spoils with affiliates. 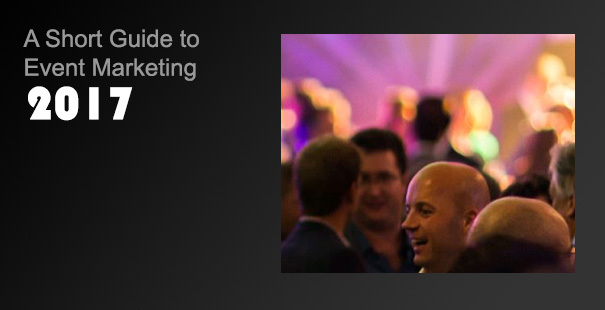 As an event marketer, your target market is mostly local and this should not sound like a bad thing. In fact, with tools such as Google Maps, local SEO has never been easier. Well, research shows that customers love local brands that are giving back to the community. This means your event marketing company must do something to get noticed. Think of promoting your events and giving back part of the proceeds to a local charity or maybe hype up charitable works in your marketing. Whatever you do, never forget the power of social. Everyone today is on social networks and you have to go big in order to win over customers. Use Facebook remarketing, videos in your tweets, post amazing picture of your past, current and upcoming events and give incentives to promote sharing. Like most local businesses, you might be going through a rough patch especially due to debt. This should not be allowed to drag you down. It is however important to refocus more energy on debt management for your business to operate without undue risks. you will find a debt relief program that suits you perfectly. Whether you want to go for consolidation or debt settlement, there are many partners ready to help get you back on your feet. There are many other considerations in event marketing and your team should always be rehashing its strategy to stay ahead. Make sure you leverage visual content marketing, social media networks, influencers, discounts and bargains to clients, blogging, customer reviews and analytics. These factors will ground your event marketing business even as competition gets stiffer. Isabella Rossellini is a marketing consultant based in Chicago. She helps local businesses in event management to cope with emerging challenges such as disruptive technology and rising costs. She is also a part time debt counsellor. Merchant Category Codes: What Are They and How Do They Affect You? There’s an awful lot of data that’s thrown at merchants and consumers where credit cards are concerned. However, from a consumer perspective, knowing how your credit card categorizes businesses is a useful tool to maximize the benefits you gain from your card’s rewards program. For merchants, knowing how your business is classified will help you make sure you’re getting the best rates for interchange fees. I’ll be going over why you should know the different, “merchant categorization codes” so you can take maximum advantage of your card and get the best benefits from them. Back in ’04, the IRS required that businesses be classified based upon the market segment that they occupy. An MCC Code is a four-digit code that a business is assigned once it starts accepting one of the two major credit card brands; Visa or MasterCard. Businesses that purchase some kind of service are required to report it on a 1099 form at the end of the year, while purchased goods don’t have the same requirements. Certain businesses are also tagged for lower interchange fees depending on the type of business that it is. While a consumer doesn’t have to worry about interchange fees for their business, MCC still affects consumers by the codes assigned to the stores that they frequent and how that comes into effect with their rewards programs for their credit cards. Say your Visa card gives you 5% cash back on groceries when you use it, you’re going to want to know what stores qualify as a grocery store according to Visa. For example, Target, qualifies as a grocery store, so knowing this, even if you purchase things that aren’t considered grocery items, because Target is a “grocery store” according to Visa, you will still receive the 5% cash back for your entire purchase. Conversely, however, you should keep an eye out to make sure that a business that you think is in one category, is in fact, in another. For example, you may think that 7-11 might qualify as groceries, but in fact it actually falls into “service stations” category. A great resource to use to find out what businesses fall under what MCC is to use Visa’s Supplier Locator website. While how MCC affects consumers is relatively simple, for merchants, it gets a little more complicated. MCC can affect a merchant’s interchange rate, now we’ve spoken about interchange briefly when we discussed tiered pricing v. cost plus pricing. However, there are a few factors, some of which are outside the business owner’s control. For example, the type of card, how your payment processing account is configured, as well as what steps you take to complete each transaction can all affect your interchange rate. For the sake of brevity, we’ll just focus on how your interchange rate is affected by how your business is categorized. Certain industries qualify for special incentive programs that mean better rates. For instance, card associations may feel that these specific industries have a markedly higher growth potential and want to encourage card use. Or, the special rate could be an incentive offered by Visa or MasterCard to promote card acceptance. Some examples of these industries include: charities, supermarkets, insurance providers, and gas/service stations. However, some businesses that do qualify for a better interchange rate don’t receive it because their accounts haven’t been properly categorized by their payment processor’s systems. To make sure you’re getting the best rate, talk to your payment processor and make sure they understand: what industry your business operates in, that your industry classification is correct, and whether or not your categorization qualifies you for a special interchange rate. These programs can lower your rates by 10 to 30 basis points lower than standard retail rates, saving merchants between $1.00 to $3.00 on every $1,000 processed.